Golden Globe-winner Clive Owen (Closer, Children of Men) returns to the West End for the first time in 18 years to play Rev. 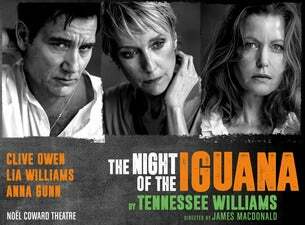 T. Laurence Shannon in The Night of the Iguana, a new production directed by James Macdonald. It features an all-star cast including Lia Williams (Kiri, Mary Stuart) as Hannah Jelkes, Anna Gunn (Breaking Bad) as Maxine Faulk and Julian Glover (Game of Thrones) as Nonno. Set in the strange limbo of 1940, in a hot and humid Mexico, a group of travellers meet at the run-down Costa Verde Hotel, where Tennessee Williams’ play brings them together in an epic battle between flesh and spirit, captivity and freedom, art and faith, heightened by a tropical rainstorm.